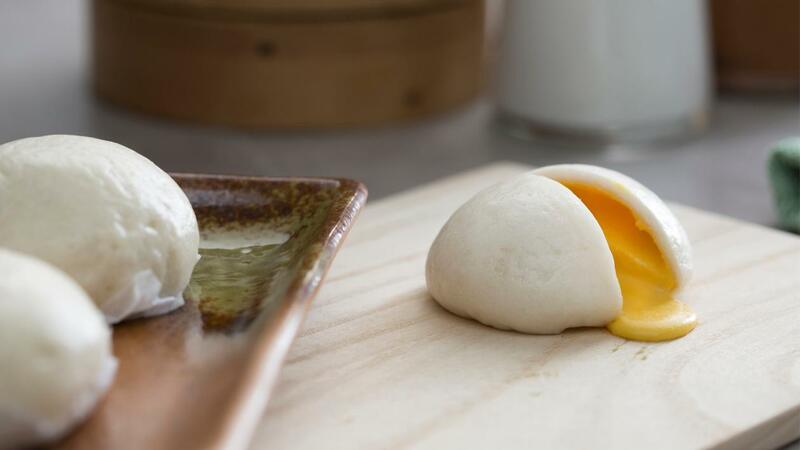 Making salted egg custard buns is now made simpler! Using a food processor, mix until everything is well combined. Add milk and milk powder until everything is incorporated. Transfer to a mold weighing 25g and freeze overnight. Using a thermomix, place water into mixing bowl and mix 30 sec/37C/speed 3. Pour water in another container, add yeast, sugar and oil rest for 4 minutes. Mix for 10 sec/speed 6. Add yeast mixture and knead 2 min 30 sec/close lid/kneading symbol. Roll out dough into flat oblong shape, form a cylinder and cut into 40g each. Arrange in tray and cover with clean towel. Rise in a warm place(50C) for 25 minutes. Set aside. Flatten the dough to give ample space for the frozen custard filling. Seal it by pinching the ends towards the centre. Line the bottom with parchment paper.